Philokalia means “love of the beautiful and good”. It was the name given to a celebrated 18th-century collection of Greek mystical texts on the Christian spiritual life, teaching the path to true sobriety and the fullness of union with God. 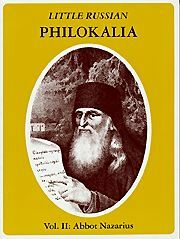 This “Little Russian Philokalia” is a new collection of ascetic texts drawn from Russian sources, chiefly of the 18th through the 20th centuries. The second volume is devoted to Blessed Elder Nazarius of Valaam (1735-1809), who influenced St. Seraphim of Sarov and was the direct progenitor of a whole century of great ascetics of Valaam Monastery in northern Russia. His “Philokalic” spirituality reached the New World through the first Orthodox missionaries to America, who had been his monks in Valaam. Among these missionaries was America’s first canonized saint, St. Herman of Alaska. Here are contained the otherworldly yet practical counsels of our spiritual forefather, showing us the way of repentance, inward purification, and salvation in Christ. Softbound. 143 pp.